(okay, I know that some of you might see some places which offers a bit of similiarity services but may not provides as many rich social network widgets as iBook (Blogger, Wordpress, Live, Ning, TypePad, Facebook, Bebo, Hi5, Orkut, Piczo) and also for sure, most of them is not free and will charge their members). To enhance your existing website or personal blog with more interactive feature for your visitors and start to build you own social network through them by building links together and benefit you and them all together. Hava heard about Link Building, Link Baiting, Network Marketing? You can think of My iBook Social Network indirectly is remixing those features to legally improve your website and personal blog SEO (Search Engine Optimization). 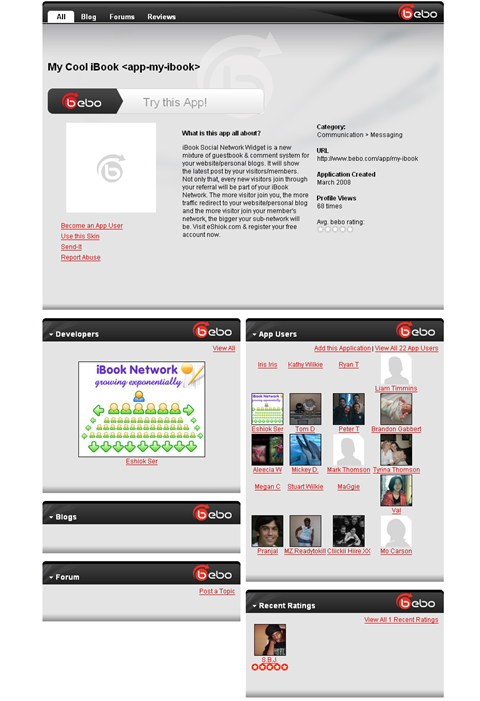 You can say My iBook Social Network is: a new mixture of guestbook, shoutbox and comment system for your website & personal blog's article, social bookmarking or online bookmarking system (such as: del.icio.us, Digg, Reddit, Furl and so on) for you to build your own social network on the Internet and to improve popularity of your website, personal blog, CMS and even to integrate back to some of those popular social network through pre-generated HTML code snippet and widget which easily can be installed to your web site, personal blogs (Blogger, Wordpress, Live, Ning, TypePad), social network (Facebook, Bebo, Hi5, Orkut, Piczo). 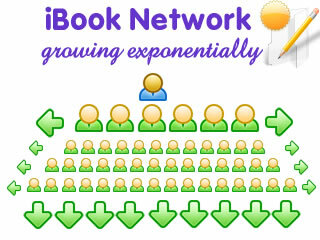 Since My iBook Social Network's concept is with network building through referral (YOU and your network members or sub-network members), you can expect an exponential growth of N levels to be expected from your own network or sub-network. New visitors or your regular visitors and members can sign (comment) on your My iBook through your website. The more of them sign on your iBook, the more often your website & personal blog will be listed on the frontpage of eShiok - My iBook Social Network directory together with other website & personal blogs. New member can register to become a member with My iBook Social Network and if it is referred through your My iBook Network then this member's My iBook Social Network will be under your network. Your My iBook Social Network link will be shown on their My iBook network. The higher traffic to your direct member's My iBook network or indirect member's My iBook network, the higher the chance visitors and other members will be visiting your My iBook network and your website or personal blogs. With its easily to install HTML code snippet to other social network or blog publishing tool (Blogger, Wordpress, Live and so on) , CMS (Joomla, Community Builder) and through Widget button for on-the-fly installation to Blogger, Wordpress, Facebook, Bebo, Hi5, Orkut, Piczo and others, you can expect your network to grow faster exponentially and on the same time to enjoy incoming traffic to your website plus SEO improvement for Search Engines. Register for a new account now. It do not cost you anything and this is what make the difference with other paid services website (offer similiarity services to boost your website). 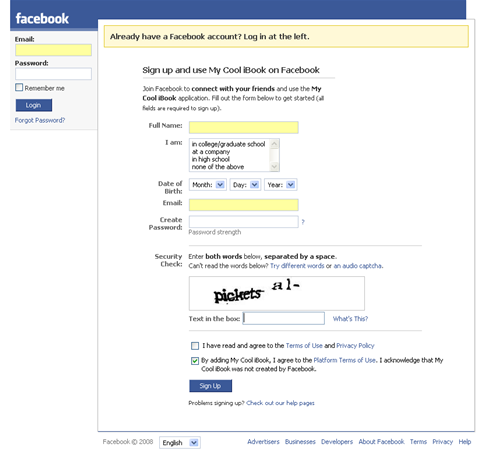 Activate your account by clicking on Activation Link sent to your email mailbox and you can login after that. Easily you can copy and paste the HTML code into your website or personal blog or social network. You can also customize the layout and the skins you want to use on your website (in a future there will be more skins added so you can change your iBook Widget at any time you wish to). Current release also provide you with automatic installation to Blogger, Wordpress, TypePad, Facebook, Bebo, Hi5, Orkut, Piczo (if you have one, your iBook Network installation will be much more easier) by only clicking on their buttons on your "HTML & Widget" page. Click to download the module for Joomla 1.0.x and Joomla 1.5.x and Joomla 2.5/1.7 . Click to download Wordpress plugin . And to join as part of VivoCiti's network, you can click on here to register for your ID .